Under contract to the California Department of Fish and Game (CDFG), Aspen assisted the CDFG and Corps of Engineers in the preparation of an EIR/EIS for a master Streambed Alteration Agreement, Section 404 Permit, and Section 2081 Take Permit for the Newhall Ranch Specific Plan. Newhall Ranch is a regionally significant development project that has been the subject of ongoing public and agency scrutiny. The Specific Plan, approved byLos AngelesCountyin 2003, allows the construction of 20,885 homes on 11,963 acres in northwesternLos AngelesCountynear the City ofSanta Clarita. The CDFG was the CEQA Lead Agency for the issuance of a long-term Streambed Alteration Agreement and Section 2081 Incidental Take Permit for the project. The Regulatory Branch of the Corps of Engineers was the NEPA Lead Agency for the issuance of a Section 404 permit for the project. The CDFG contracted with Aspen for assistance in administering the EIR/EIS process and to provide expert technical review services for all issue areas. 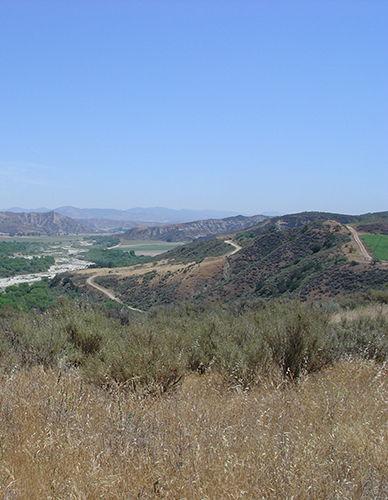 Because the EIR/EIS was being prepared in support of permits for alteration of riparian and wetland habitats, the analysis focused on the direct effects on the Santa Clara River and tributary streams within Newhall Ranch, as well the indirect effects of development in adjacent upland areas. Development of the Draft EIS/EIR took nearly five years. During that time, project alternatives were developed and refined in order to formulate a broad range of development scenarios for Newhall Ranch and to reflect different options for avoiding impacts to jurisdictional waters and protecting sensitive species. Aspen worked with the CDFG, Corps of Engineers, and the applicant to develop a comprehensive analysis of impacts, with particular emphasis on developing a robust analysis of CDFG trust resources, including sensitive species, and the jurisdictional features on the project site, including the Santa Clara River, tributaries, and various special aquatic sites. Aspen provided guidance and advice regarding field surveys and data collection, the approach to the impact analysis, and the EIR/EIS format and organization. Aspen also supplemented the descriptions of the environmental setting and the analysis of impacts prepared by the applicant, particularly regarding jurisdictional features and plant and wildlife resources. Aspen also assisted in the formulation of mitigation measures, including strategies for minimizing impacts to habitat areas and the long-term management of plant and wildlife resources. Newhall Ranch supports several populations of the endangered San Fernando Valley Spineflower, a rare plant previously thought to be extinct. Aspen worked with CDFG in development of a conservation plan for the spineflower, including the establishment of new spineflower preserves on Newhall Ranch. The issuance of a 2081 Permit for “take” of the spineflower is one of the actions analyzed in the EIR/EIS.